Marina, a transsexual woman who works as a waitress and moonlights as a nightclub singer, is bowled over by the death of her older boyfriend. Nominated for Best Foreign Picture at the Oscars. A very interesting portrait of a transgender woman who experiences social challenges and prejudice as she navigates the events following the sudden death of her much older partner. 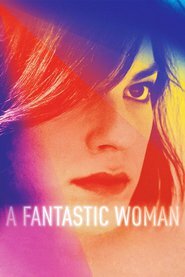 Played by Daniela Vega, who is an actual transgender woman and is excellent in the role with a very engaging onscreen presence. The story provides insight into what transgendered people often have to experience from society’s responses. Unfortunately, the movie doesn’t spend enough time helping us to get to know the protagonist as a person — who she is, her history, her as an individual. It is mostly focused on people’s reactions to her. Directed with subtlety and tenderness, this is an important movie definitely worth seeing.